This is the next installment in a series that looks at how the elite swim the 200 by looking at their race splits. This time we’re analyzing the 200 backstroke for men. In the 200 free analysis (link) we found that the men and women swam remarkably different races. The top women generally had the fastest 50 PBs and swam it like sprinters, while the top men swam it with an aggressive Distance Profile. Strangely, the 200 backstroke for women flipped that around completely, with the majority of the 24 swimmers using a Distance Profile. You can find the 200 backstroke for women analysis here. Thanks to a lot of suggestions, and some renewed thinking about the data, the backstroke analysis is quite different than the freestyle. 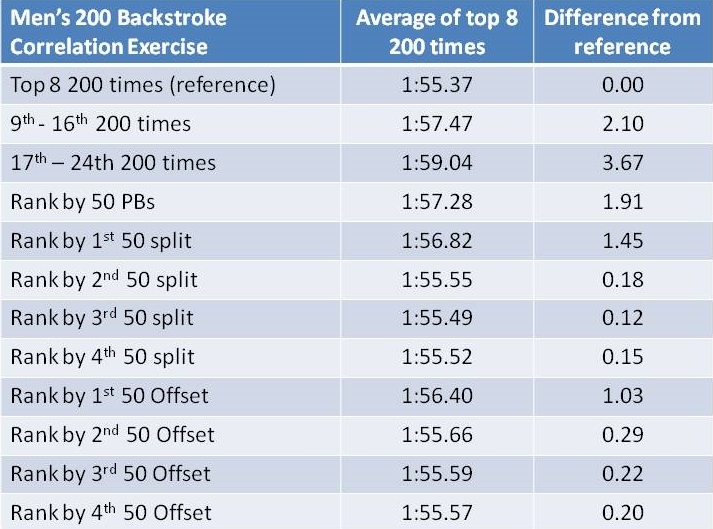 There is now more focus on identifying the key common strategies used by the 24 swimmers, and then how / why the top 8 are the top 8, and then why the Olympic champion is the best. The data set consists of 24 elite men at the time of the 2012 Olympics. I used the Olympic finalists and semi-finalists as 16 of these swimmers, and then filled in the rest with the US Olympic trials finalists and semi-finalists. For each swimmer, I used the fastest time they swam during the competition. I also knew that I would have to look at more than just raw splits, in order to compare sprinters to more distance-oriented swimmers, and to provide value to non-elite swimmers. As a result, I also used their 50 Personal Bests [PBs] as well. For a few swimmers for which the 50 PB was unavailable or absurdly old, I either had to infer their 50 PB from their split on a 100, or else exclude them from the analysis. 1) What are the different ways in which the elite 24 swimmers swim the 200 backstroke? It’s more or less divided into those swimmers who are sprint-oriented, endurance-oriented, and in-between. In these analyses I refer to race profiles. These profiles describe the pattern of the swimmer’s 50 splits. I’ve identified three common profiles, which I call Sprinter, Distance and Hybrid. A Sprinter Profile is one in which each split is slower than the one before. A Hybrid Profile is one in which the 4th 50 is roughly the same as the 3rd 50, and a Distance Profile is one in which the 4th 50 is noticeably faster than the 3rd 50. It’s important to remember that if a swimmer swam at a constant speed throughout the race, the 1st 50 would be the fastest because of the start (worth roughly 1 – 1.5 seconds after you factor in the post-turn foot touch), and the last 50 would be the next fastest because that split doesn’t include a turn at all (worth roughly 0.5 seconds for freestyle and backstroke). This imaginary swimmer would then swim the 2nd and 3rd 50s in exactly the same time. It so happens that the women’s 200 freestyle analysis provided us with excellent examples of these three profiles. I’ve included Katie Ledecky in this as she takes the aggressive distance profile to an extreme. How do the Elite Swim the 200 Backstroke? Here we are looking to determine the different race strategies elite men use in the 200 backstroke. In the 200 Free for men, we saw only a little importance attached to the 50 PB, but enormous importance attached to the 1st 50. In addition, the men generally swam a very aggressive race profile without a lot of slowing from the 2nd to the 4th 50s. We’ll start off the men’s analysis with grouping the 24 men into three groups of 8 based on their 200 times, and then averaging the splits for each group. We can see from this graph that the Bottom 200 Time group clearly has a Sprinter’s profile. The Middle group has an exemplar Hybrid Profile, and the Top group has a profile bordering Hybrid and Distance. I’ll now include the 50 Offsets for the same groups (50 split minus that swimmer’s 50 PB, and then average the offsets for each group of 8). We can see that these elite 200 backstroke swimmers get to this status through three different strategies. The Top 200 Time group, on average, uses a mild Distance profile characterized by the smallest Offsets and the fastest splits for all four 50s. The Bottom 200 Time group use a Sprinter Profile, in which they start fast and finish slower. And the Middle 200 Time group uses a Hybrid Profile with an aggressive second half of the race. In other words, there is no one profile or strategy that describes the elite-level 200 Backstroke during the summer of 2012. Why are the Top 8 Better Than the Rest? We’re next going to look at the what the top 8 are doing that makes them better than the other 16 elite swimmers. The best way to do this is to try to identify some specific aspect of the race that the top 8 do differently than the rest. Examples of this aspect could be their 50 PB, 1st 50 split, last 50 split, etc. And to measure the impact of this specific aspect, we’ll group the 24 swimmers into 3 groups of 8 according to this aspect, determine the average 200 time for the Top group, and then compare this 200 average to the 200 time average of the top 8 200 backstroke times. The smaller the difference between the two averages, the more important that aspect of race. The biggest surprise here is the lack of a correlation between the 1st 50 split and the top 200 times. For both 200 freestyles (men and women) and the 200 backstroke for women, the fastest swimmers at the 50 mark were generally the fastest swimmers at 200. That’s just not the case here. We also see that the splits for the 2nd-4th 50s all have very good correlations, meaning the top swimmers were generally fastest on those 50s. What’s surprising is that there is also a good correlation with the offsets for those 50s. Meaning that these swimmers were very aggressive, swimming the fastest 50s while being the closest to their 50 PBs. The best correlation is with the 3rd 50 Split, so let’s take a look at that. The Top 3rd 50 Split group includes the top 5 finishers, as well as the 7th fastest, so the 3rd 50 clearly correlates strongly with the fastest 200 times. From this graph we can see that, on average, these swimmers follow an aggressive Distance Profile, and have taken control of the race by the 2nd 50. The Middle group, on average follows a Sprinter’s Profile, while the Bottom group, on average follow the Hybrid Profile. So while the top 24 swimmers cover all 3 profiles, the top 8 tend to use a Distance Profile. Unlike the top women 200 backstrokers who used their excellent PBs to pull away from the field with fast 50s and higher Offsets, the men swam the last three 50s very close to their PBs. Now we’ll drill down a bit deeper and try to figure out why Tyler Clary is the best of the best. This first graph shows the raw 50 splits for the top 8 swimmers. We can see here that Tyler Clary starts out with the pack for the first two 50s, and then explodes out in a strong Distance Profile. I should point out that Clary has only the 14th fastest 50 PB out of the field of 24, and so his strategy makes sense. He doesn’t have the front-end speed to stay up with the early leaders. Second place finisher Ryosuke Irie (with the 5th fastest 50 PB) used his speed to his advantage in the first 100, but just couldn’t stick with Clary on the 3rd 50. Third-place finisher Ryan Lochte (10th fastest 50 PB) took the first 100 out the fastest, but couldn’t match the closing speed of those two, perhaps due to his first 100 efforts. Next, we’ll look at the Offsets for those same swimmers. Again, we see that Clary with his relatively slow 50 PB just has to outwork everyone, with small offsets every step of the way. Irie, with his fast 50 PB was able to swim with higher offsets to get his Olympic Silver. Here are two potential uses of the data above. From our 3rd 50 Split graph, we have basic profiles for sprint-oriented, distance-oriented and hybrid men doing the 200 backstroke. Below are the average offsets for each 50 for each of these profiles. We can use these to work backwards from a 200 goal time to determine a set of 50 splits. This table shows the method. We’ll use a goal time of 2:00.00, and we’ll run it for all three profiles. Subtract the Total Offset for the profile you want, then divide the result by 4 to get a base time for the 50. Then add back in the Offsets from the table above for the selected profile. 2. Based on your 50 PB, determine the 200 time if you swam the race like the elite. We can also use the profiles of these elite swimmers, and the swimmer’s 50 PB to come up with their 200 time. Let’s assume a 50 Backstroke PB of 28.0, and we want to know how fast this swimmer would go with the offsets from these elite swimmers. The elite men swim the 200 backstroke with a good combination of the three profiles: Sprinter, Distance and Hybrid. (It seems this race is accessible for all swimmer types.) For this group of swimmers, the 50 PB and 1st 50 Split were not good indicators of success, which is an indication that the race was not dominated by sprinters. Instead, the 2nd through 4th 50 splits AND Offsets were good indicators of success. This was a race of tough grinding. The Olympic champion, Tyler Clary has a relatively poor 50 PB, and doesn’t push to swim with the leaders on the opening 50 or 100, but then unleashes a vicious last 100, swimming the last two 50s with Offsets of 2.6 and 2.2 seconds. Ryosuke Irie used his excellent 50 PB to get out fast, but couldn’t match Clary’s closing speed. Rick, first of all…I love the numbers crunching, especially since I am a Math teacher/swim coach. I would love to see you use 100 PB instead of the 50 PB for comparisons in the 200. You would find much more accurate data for the Back/Brst/Fly 200s, because they ALL swim both the 100 and 200. Many of your “hybrid/Distance” types rarely swim an all out 50 of that stroke; or like you say, it is way too old of a time to be useful. What I have looked at (not to the depth you have!) is to take the 100 PB, double it, and then add X seconds to determine where they should be for the 200. For instance, women’s 200 Back is roughly Double 100 Back +7-8 seconds and that is very close to the 200 back time. Missy Franklin = Double +7.4. Guys are closer to +8-10. 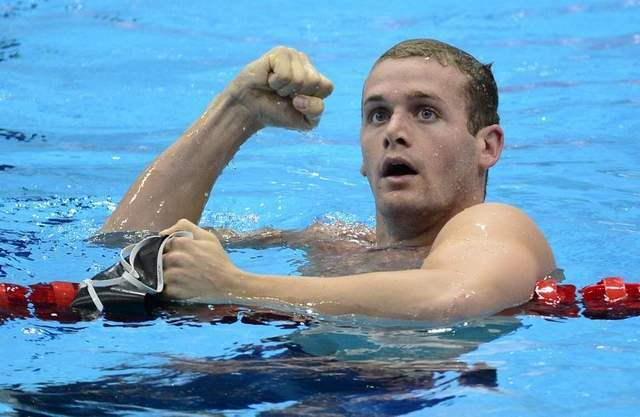 Aaron Peirsol = double +8.04. Thanks for the comment, Gordy! I think your observation is an excellent way to generalize about using 100 PBs to determine an appropriate 200 time. Or the reverse, of course. I was primarily looking at trying to determine the various ways that elite swimmers race the 200. And by using 50 PBs I was able to identify and separate out a racing strategy for sprinters. Further analysis also allowed me to estimate a racing strategy for more distance-oriented swimmers. In fact, I did start off by looking at 50 and 100 PBs, but the 100 data was just too close to the 200s for me to get much out of it. For instance, I went through the women’s data and separated the swimmers by their profile (sprinter, hybrid and distance). Here’s what I got for your equation. You’re absolutely right in that 7.8 is a good general number, but the range displayed by these swimmers is huge. I like the idea of using profiles and offsets simply because they lend themselves to use by those who are not elite. A sprint-oriented swimmer can develop a 50-by-50 strategy for the race based on the sprinter profiles. Same with distance-oriented swimmers. It provides a wealth of information that is harder to find when looking at 100 PBs. Hi Coach Rick great article is this based on short or long course racing strategies. Short course tactics are slightly different than long course. Traditional racing strategies divide the race into traditional measures which are the boundaries of the swimming pool. If we think outside of the box our personal best can be taken at another time (place) or taken from another timing angle that is different from the time sheet. This will translate into the swimmer attacking at an unexpected place and time or changing tempo when needed. Hi Luther. Great comment. This set of data only consisted of long course, as it dealt with the 2012 Olympics and 2012 USA Olympic Trials. I agree completely that strategies for sc can be completely different than lc. In fact, these days, they are almost different events. I did another blog on SC to LC conversion rates, and found that there are few events for which the sc and lc world record holders are the same person. Your point about different strategies is well taken. In quite a few of these posts on elite 200s, the winner broke the mold and did something different. It may just come down to who is swimming (for a best time) and who is racing (for the win). Without any significant drafting, as we see in open water swimming, running and cycling, its difficult to say which is best. Racing for the win involves a leap of faith – that you can go faster by putting yourself in a position to win. The downside is that you can easily do worse as well. Swimming for a PB is a less adventurous but less risky approach.